Windmill software lets you continually log data from A & D balances, and other instruments with an RS232 serial port, on a PC running Windows. All data is time-stamped and can be imported into Excel either during or after data collection. Our Windmill data acquisition software is currently reduced from £145 to £50. Alternatively, subscribers to the Monitor newsletter (ISSN 1472-0221) can download free logging software: ComDebug. This lets you log data from one instrument and save it in a text file. After collection is finished data can be imported into Excel. To use Windmill to collect data from a A & D balance: download the software then..
Run the Windmill ComDebug, select Create a new Windmill Instrument File, and enter your balance's communication settings. 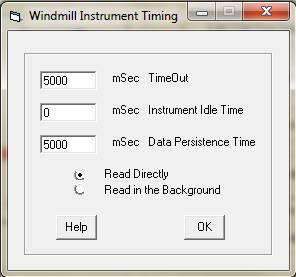 Run the Windmill DDE Panel, Logger or Chart program to save or display data from your balance. After you have entered your configuration settings with ComDebug, you don't need to use this again and can go straight to the logging and display programs. For an overview of entering the configuration settings see the Getting Started with COMIML and ComDebug page. Specific example settings for an A & D FX3000 balance are given below. In ComDebug's Terminal or Message Screen, enter a command or prompt string to send to the balance to ask for data. Click the Send button, and the instrument should send a reply (see Trouble-Shooting below if not). Now click the Parse button and enter instructions to extract the data from the balance's reply. Check your balance's Manual for details of the commands to send, and the format of the balance's reply. The example given below requests the weight immediately. Use the non-print menu to enter the carriage return (<CR>) and linefeed (<LF>). From the File menu select Load Hardware Setup and choose the *.ims file you just saved. Connect your weight channel. You should see the correct weight in DDE Panel. Proceed similarly for the Logger and Chart programs. You can use the Windmill Logger or ComDebug program to collect data, and after collection has finished import it into Excel. Alternatively, you can collect data with Excel in real-time by using an Excel macro to read data from the Windmill DDE Panel or RTD server . If you are unable to get data from your balance go back to ComDebug's Message screen. Make sure your command is shown in the prompt grid, like in the picture. Click the Send button: does your instrument reply? If using a USB-RS232 converter, make sure that its settings also match those used by the balance - read the USB-Serial page for details, especially point 7. If still no luck see our Testing Serial Port Communication page. If, in ComDebug you see data coming in but DDE Panel isn't showing it, you may need to edit your parsing settings. Go to ComDebug's Terminal or Message Screen, click the Parse button. Enter your Ignore and Extract Settings and click the Step menu. Is your data shown in the Value column? If not adjust your settings.